Burglary is a high-volume crime that impacts upon the general public and, particularly, on those who are victimised. 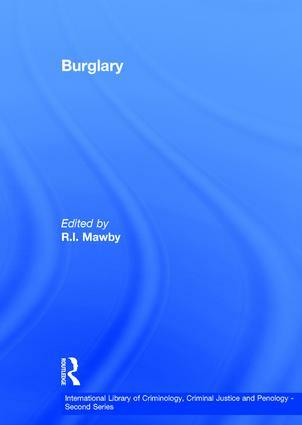 This selection of readings addresses both the nature of burglary and policies directed against it. Articles from Britain, the US and across the world, describe and explain the crime and why offenders choose to commit it and provide a critical overview of programmes that have been implemented to reduce burglary and its impact. Contents: Introduction; Part I Burglary: Risk and Impact: Repeat victimisation: offender accounts, Julie Ashton, Imogen Brown, Barbara Senior and Ken Pease; Prospective hot-spotting: the future of crime mapping?, Kate J. Bowers, Shane D. Johnson and Ken Pease; Residential burglary in the United States: life-style and demographic factors associated with the probability of victimization, Lawrence E. Cohen and David Cantor; The rational and opportunistic burglar, Paul F. Cromwell, James N. Olsen and D'Aunn Wester Avary; The effect of criminal victimization on a household's moving decision, Laura Duggan; Ecological and behavioral influences on property victimization at home: implications for opportunity theory, James P. Lynch and David Cantor; The impact of burglary upon victims, Mike Maguire; The impact of burglary: a tale of 2 cities, R.I. Mawby and S. Walklate; Residential burglary in the Republic of Ireland: a situational perspective, C. Nee and M. Taylor; State differences in burglary victimisation in Australia: a research note, Timothy Phillips and John Walker; The time course of repeat burglary victimisation, Natalie Polvi, Terah Looman, Charlie Humphries and Ken Pease; Burglary revictimisation: the time period of heightened risk, Matthew B. Robinson; Burglary victimization, perceptions of crime risk and routine activities: a multilevel analysis across Seattle neighborhoods and census tracts, Pamela Wilcox Rountree and Kenneth C. Land; Repeat burglary victimization: spatial and temporal patterns, Michael Townsley, Ross Homel and Janet Chaseling; Property crime victimisation: the roles of individual and area influences, Alan Trickett, Denise R. Osborn and Dan Ellingworth; Commercial burglars in the Netherlands: reasoning decision-makers?, Eric Wiersma; A snowball's chance in hell: doing fieldwork with active residential burglars, Richard Wright, Scott H. Decker, Allison K. Redfern and Dietrich L. Smith; How young house burglars choose their targets, Richard Wright and Robert H. Logie. Part II Policy Response: Small business crime; the evaluation of a crime prevention initiative, Kate J. Bowers; Critically reviewing the theory and practice of secured-by-design for residential new-build housing in Britain, P.M. Cozens, T. Pascoe and D. Hillier; Solving residential burglary, Timothy Coupe and Max Griffiths; Safer cities and domestic burglary, Paul Ekblom, Ho Law and Mike Sutton; Helping the victims, Martyn J. Gay, Christopher Holton and M.S. Thomas; Police response to crime: the perceptions of victims from 2 Polish cities, R.I. Mawby, Z. Ostrihanska and D. Wojcik; House burglaries and victims, D. Nation and J. Arnott; Private cops on the block: a review of the role of private security in residential communities, Lesley Noakes; The Kirkholt project: preventing burglary on a British public housing estate, Ken Pease; The theory and research behind Neighbourhood Watch: is it a sound fear and crime reduction strategy?, Dennis P. Rosenbaum; Name index.